With few officers on the beat, it’s critical that cops have the tools to let them know in advance where crimes are most likely to occur. As tax bases shrink and revenues continue to slide, cities and counties are faced with a tough assignment – how do lawmakers and police officials manage to keep crime down with smaller budgets and fewer officers? In Atlanta, Georgia and Modesto, California, predictive policing solutions have done exactly that. Not only does the powerful software allow agencies to get the job done with fewer bodies, it’s also a new model for more effective crime fighting. “We’re trying to get away from rearview policing, looking at crime that has happened,” Modesto Capt. Rick Armendariz told CBS News recently. Modesto was a pioneer in the application of predictive policing and has seen tremendous success. The basic idea is a simple one – in the old days cops simply reacted. A crime occurred, was reported and police responded. Predictive policing allows agencies and personnel to be proactive by letting cops know where crimes will happen. Modesto Police say the small red boxes on the computerized map show predicted hot spots for crime. The program crunches data and spits out a new top-10 list for every shift and every patrol officer. “It looks at our crime history the last 10 years using a mathematical equation and it gives us what we call a high probability of where the next crime is going to occur,” Armendariz said. 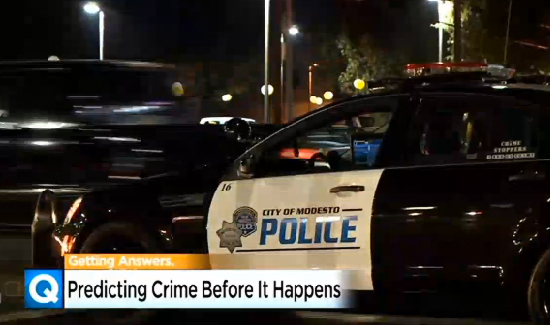 Since Modesto tried predictive policing property crime has dropped to a three-year low. Residential burglaries are down 20%, commercial theft is down 13%, auto theft has dropped 12%, and an 11% drop in robberies. The only thing up in Modesto are arrests. In Atlanta, Georgia police have had a similar awakening. Atlanta Police Lieutenant LeAnne Browning recalls her days as a patrol officer. “Our lieutenants would say, ‘Okay, I want you to look at the beat books so you can know what’s out there on your beat.’ Well, the beat books are like this thick with reports,” she says, holding her hands a couple of feet apart. “And you’d sit there and thumb through it all, and there was no time because they were then kicking you out of the precinct to handle calls.” She pauses before pointing to her computer screen. “That’s the old way of doing things. This… it’s right here,” Brown told Atlanta Magazine in a recent interview. Browning was talking about the same tools in use in Modesto – predictive policing software. The Atlanta Police Department says using the PredPol technology, has been a huge success. And with smaller budgets, retirements and rising crime rates it’s only a matter of time before other agencies follow Atlanta and Modesto’s lead on PredPol.